Two weirs in the diverted river reach of the Rhine near Rheinau, which dam up the water level of the residual discharge to the one before the construction of the power plant at mean flow, prevent the development of a near-natural discharge pattern. The concession of the hydropower plant will expire in 2036, but according to the Swiss Water Protection Act diverted reaches of hydropower plants have to be reconstructed. The planned revision of the turbines and the resulting higher discharges in the diverted reach were the cause to investigate the local conditions and define potential enhancement measures. Objective of this project was to determine guidelines for the reconstruction of diverted river reaches according to the Water Protection Act. The flood event in May 1999 showed again, that Lake Thun has an insufficient discharge capacity in certain meteorological situations and is not able to divert the inflow. 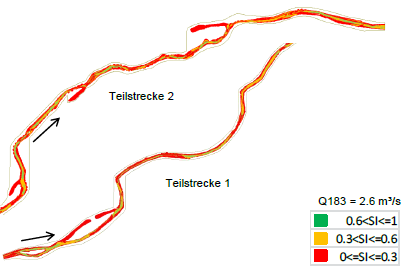 Therefore the Department of Water- and Energy Management of the canton Bern investigated a potential increase of the outflow cross section by lowering the Aare river bed at the outflow of Lake Thun. Thus the discharge conditions could be improved and the risk of flooding for the city of Thun could be reduced. Different alternatives of dredging were investigated hydraulically and evaluated concerning their discharge capacity. One of the main objectives of the ecological investigations was the disturbance of the valuable grayling spawning habitats at the outflow of the lake. SJE investigated the spawning habitats at the outflow of Lake Thun with colleagues from EAWAG. At first a hydrodynamic-numerical 2D model was set up. Based on the substrate information sampled in field measurements, discharge measurements and mapping of the spawning habitats, predictions about the potential spawning habitats were generated with CASiMiR. These predictions provided statements about the effects for different dredging variants and thus recommendations to preserve the spawning habitats of national importance. In the context of the relicensing of the hydropower plant Kembs, Canal d’Alsace, operated by EdF, one of the main objectives was the establishing of an ecological minimum flow. The Canal d’Alsace is labeled with a major significance to the repopulation of Atlantic salmon. 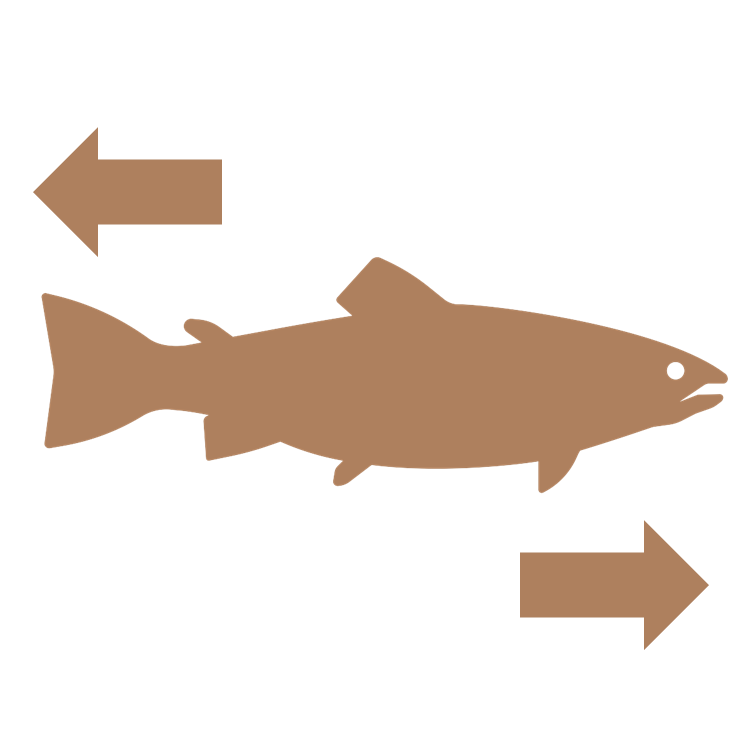 Therefore a key factor of the future flow regulation was the provision of suitable spawning habitats for Atlantic salmon. Furthermore the preservation of the existing valuable breeding grounds and pioneer locations were objective of this project. In the approx. 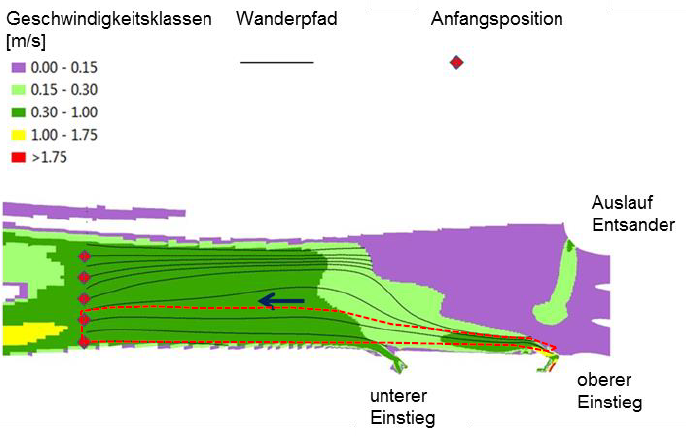 40 km long diverted river reach of the Upper Rhine, ecohydraulic simulations were performed for 5 different reaches. The objective was to investigate discharge-dependent variations of the fish habitats, especially for the target species Atlantic salmon. The calculations were based on field measurements, sampling the geometry and morphology in the different reaches. Furthermore measurements of water surface elevations and discharge were conducted to calibrate the used hydrodynamic-numerical 2D-models. Water depth, flow velocity, wetted area and derived from that the habitat conditions could be determined for any discharge, resulting in an optimized flow regulation adapted to the course of the year. A 1d model was set up for the whole 40 km stretch and used to determine the impacts of the discharge variations in the whole stretch. The mean annual working capacity of the hydropower plant Nachrodt, Lenne, was significantly lower than the technical potential. Like in many other cases the reason was a non-automated operation and the wear and tear of turbines and generators. Furthermore losses, because of non-operating periods due to damages of the hydropower plant, were responsible for the reduced working capacity. 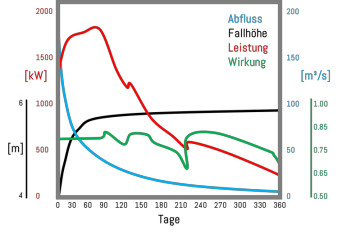 In many cases the decision to revision respectively to a new turbine is a quite difficult choice, because local boundary conditions are not taken sufficiently into account. The module CASiMiR-Hydropower allows to compare existing offers of modernization on an equivalent level. 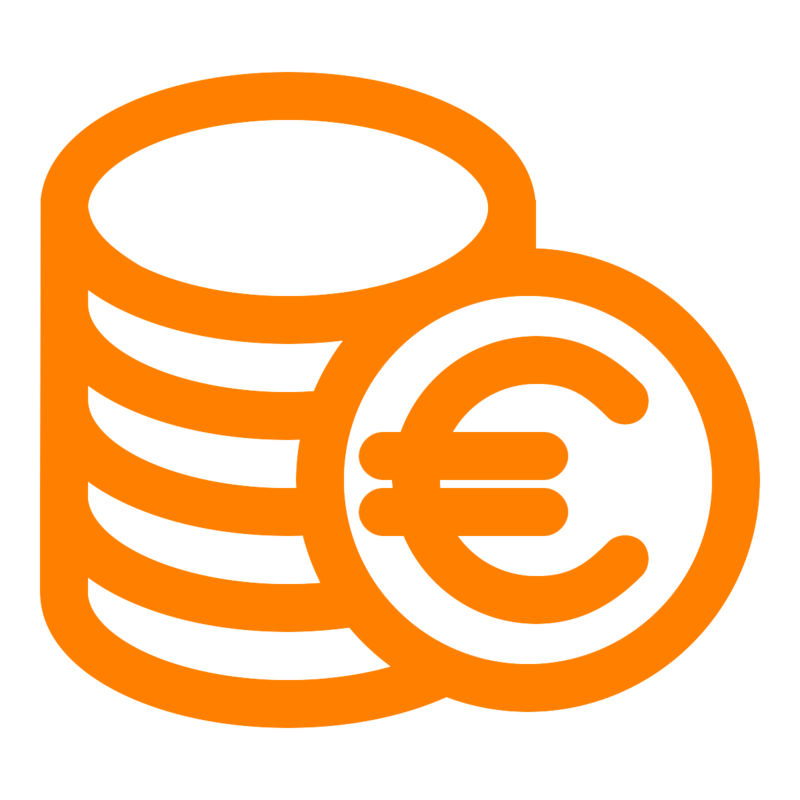 Evaluating the different alternatives in an objective and individual manner, concession periods, amortization time and achievable feed-in remuneration were the decisive factors. Calculations of the working capacity and the resulting profits of the hydropower plant were performed. 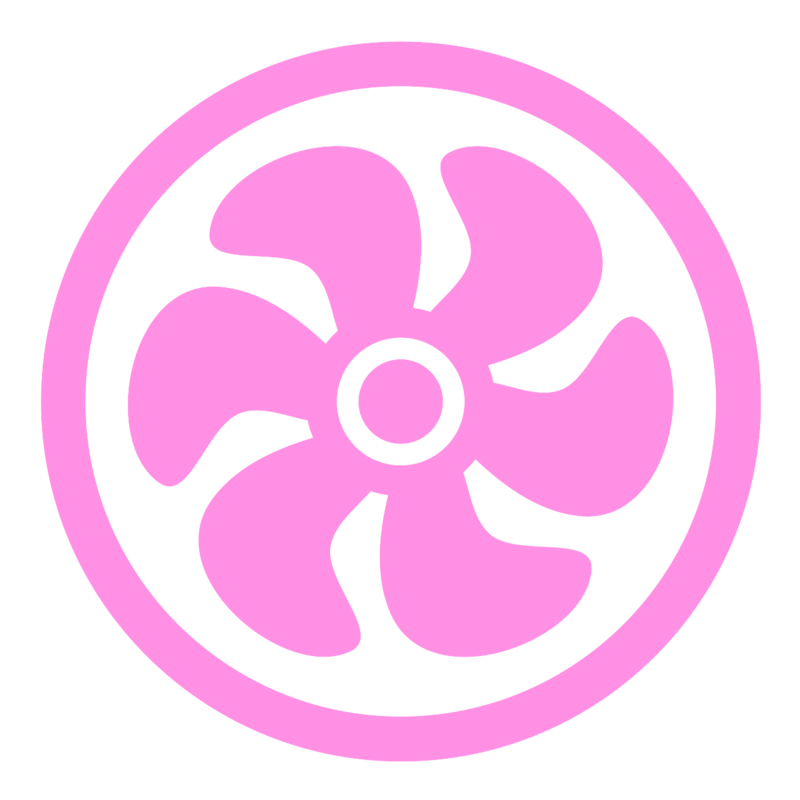 The following variants were considered: revision of the three built-in Francis turbines, combination of one refurbished Francis turbine with new Kaplan, Francis, bevel gear or bulb turbines. The energy efficiency calculations were performed using the module CASiMiR-Hydropower. An economic efficiency analysis, based on the present value method with variable runtimes and variable feed-in remunerations, led to a modernization fitted to the requirements of the operator. 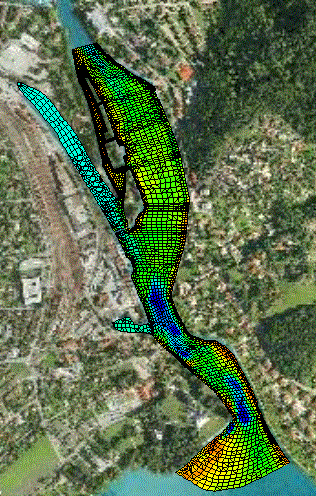 Because of its heavily modified stream course in large sections the Alpine Rhine shows a morpho- and hydrological unnatural and poorly structured condition, which is additoinally characterized by artificially generated, hydropeaking discharges. Hydropeaking affects the ecology and morphology with a substantial impact. On the basis of a river-specific quantification of the hydropeaking consequences, a sustainable hydropeaking operation design should be developed, taking ecologic as well as economic aspects into account. In the course of extending the hydropower plant Imst, TIWAG planned the construction of a fish pass at the weir Runserau. This project was executed based on the field measurements, already done by TIWAG and the design documents of the fish pass. Objective of the project was the retrievability of the fish pass, which is an important factor to its proper functionality. The retrievability is depending on the location of the inlet with regard to the migration corridor of fishes, on the distance to the migration barrier and on a sufficient leading flow. Based on the calculation results of the hydrodynamic-numerical model (water depth and flow velocity) different scenarios, predefined by TIWAG were evaluated in regard to the retrievability of the fish pass. Different fish life stages were investigated using different ethohydraulic (related to the hydraulic preferences) flow categories. To consider the flow direction, SJE implemented a “backward particle tracking” Euler approach into the new module CASiMiR-Migration. Migration corridors were calculated for different discharges, which predict the leading flow to the inlet of the fish pass. 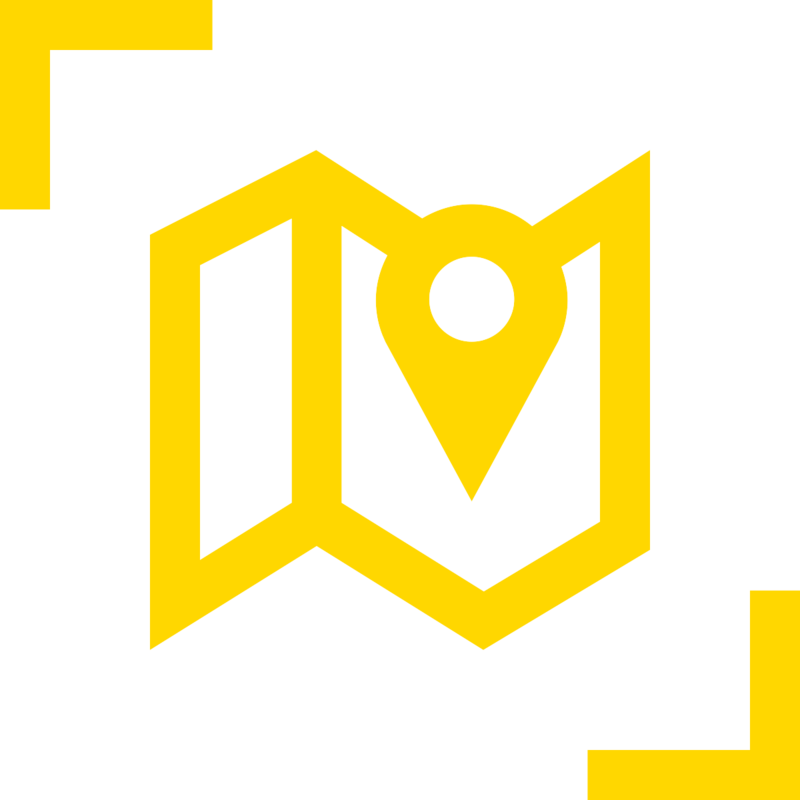 A publication about the project can be found here. To achieve the guidelines from the European Water Framework Directive (WFD) a feasibility study of the river Glatt should be developed. On long reaches the Glatt shows a canal-like, straight river course, which should be changed to a near-natural restoration, respectively a relocation of the river course to its ancient natural situation. Such substantial modifications require a feasibility study, which depicts the development potential with consideration of flood protection as well as competing claims of use (hydropower, agriculture, leisure). A shortcoming analysis was obtained with the help of fish habitat modeling. 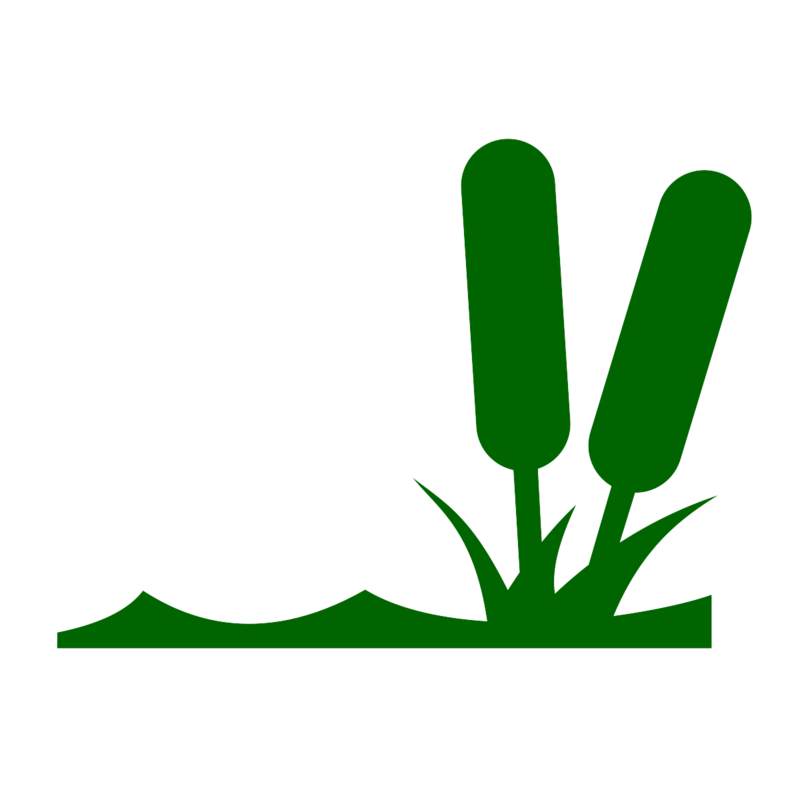 Resultant near-nature restoration measures with high ecological benefits could be determined for the investigated water body. Not only could the reaches in deficit be located, but also inevitable objectives such as the establishment of locations and scopes of spawning or juvenile habitats could be stated. Different scenarios were evaluated with regard to their effect on fish habitats. The designs of the different measures were reevaluated multiple times and optimized in an iterative process, leading to the best possible result. Urban rivers are facing numerous threats to their water quality and quantity. This project investigated different approaches to implement the guideline of the European Water Framework Directive (WFD) into the heavily modified, urban river Panke in Berlin. A model-based design for restoration was developed in an interdisciplinary, iterative approach. High resolution, hydrodynamic-numerical 2D-models (HN-models) in combination with ecological experts and habitat modeling should lead to an optimized channel design. On the basis of the calculations from the HN-model and the in the field sampled morphological data, habitat modeling was performed for the determined target species gudgeon, dace, three-spined stickleback and four taxa of benthos with different hydraulic preferences, using the software CASiMiR. It could be shown, that in the initial state there are only a very limited range of habitats available, which change substantially with variation of flow and might disappear completely depending on the discharge. The habitat conditions changed in a positive manner after implementing the restoration structures into the models. Quality and quantity of the habitats showed a lower dependence on the discharge and are present during high and low flows. A sensitivity analysis was performed by changing the input parameters and verified a stable model without discontinuities, for a variation of the input parameters. In general it could be shown, that the planned restoration leads to a higher increase of habitats than a simple increase of discharge. Therefore a morphological enhancement of the mostly monotonous Panke is strongly recommended. To extend the hydropower plant Kirchbichl, the TIWAG had to execute an Environmental Impact Assessment (EIA). A major aim to improve the ecological situation in streaming waters is a secured migration connectivity and the preservation of the river-specific water and riparian habitats. 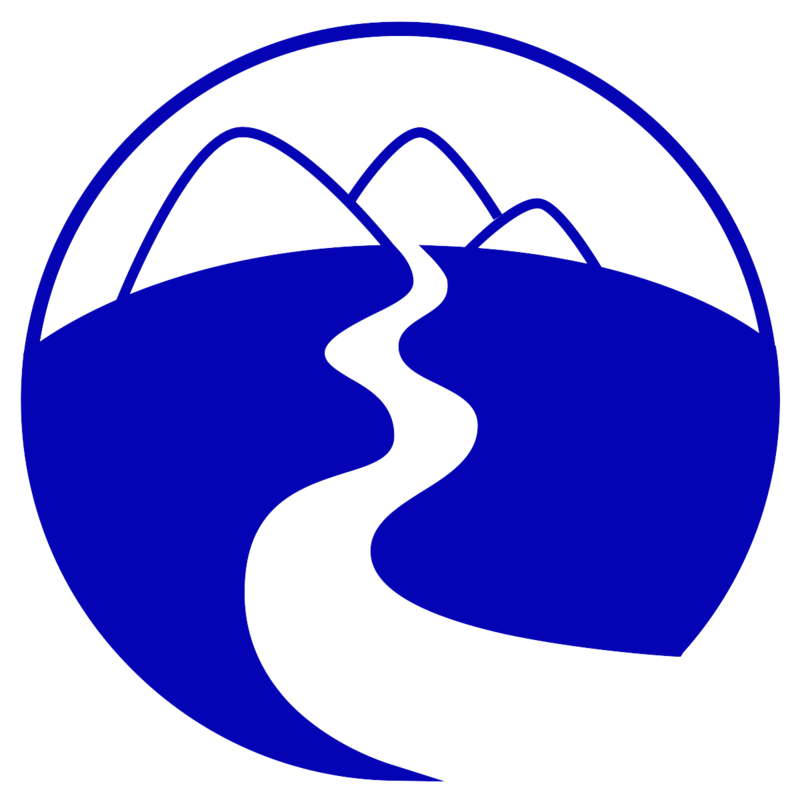 Therefore the three aspects migration passage, habitat quality and quantity for fishes and benthic invertebrates in reaches with water diversion and leading flow to the fish pass are subject of the EIA. In addition the impact of the extended power plant on semi-terrestrial habitats was investigated. To preserve functional migration connectivity it is compulsory to remove all migration barriers and to provide sufficient water depths and velocities for the target species. The achievement of these minimum requirements was investigated with hydrodynamic-numerical modeling, illustrated with CASiMiR and subsequently examined and evaluated. SJE set up a habitat model for ground beetles, which need periodically flooded areas and which are strongly dependent on the morphology of these areas. Those habitats where investigated using the fuzzy-logic approach implemented in CASiMiR. The impact of the changing hydrological and hydraulic conditions on these habitats were predicted and ecologically evaluated. Due to embankment, shortening and straightening of stream courses and bank protection in the last centuries, the riparian and river ecosystem of the stream Elbe has changed extensively. The disruption of a dike near Lenzen enables a frequent flooding of a floodplain. This project investigated the long-term development of vegetation in the floodplain. The main objective of the project was to determine the stages of succession and the development velocity of the formerly for agricultural purposes used area, in the next 150 years. The development of vegetation was simulated with the floodplain-succession model CASiMiR-Vegetation. 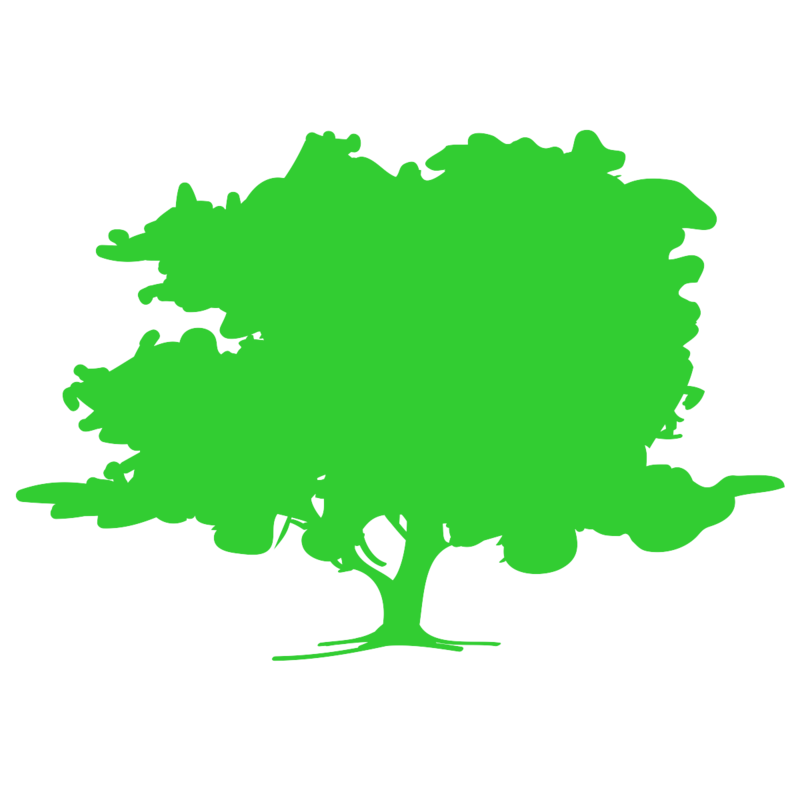 SJE modeled the relevant discharges, which were input parameters of the vegetation model. 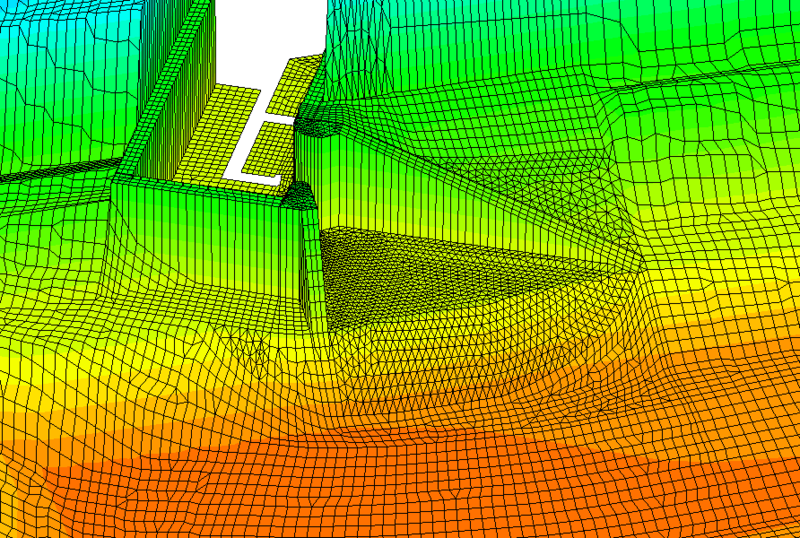 Modeling was performed for the initial condition (topography) as well as for a changed geometry of the inflow cross section. 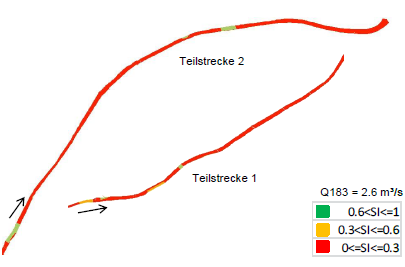 A 2D, hydrodynamic-numerical model was used for simulation based on the data provided by Bundesanstalt für Wasserbau. The model was calibrated for different water surface elevations at mean and high flows. Depending on land use and the shaping of flood channels behind the slotted dike, different scenarios of vegetation development could be simulated. 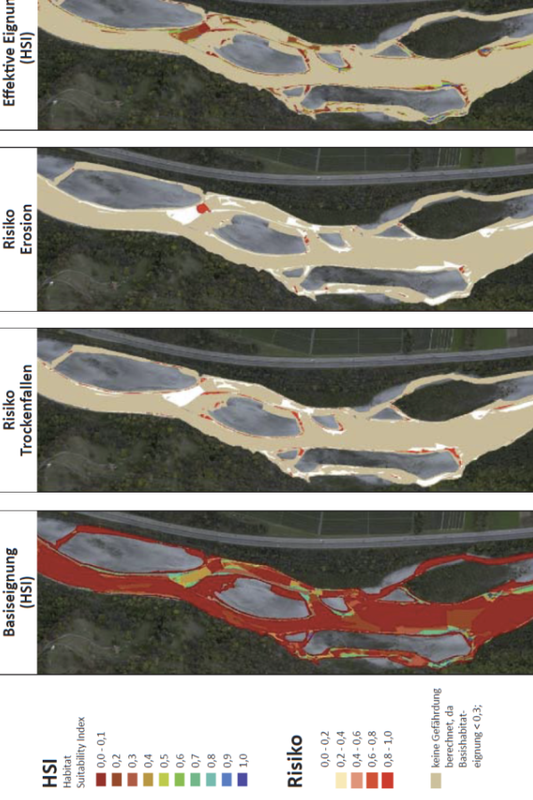 Based on these modeling results, a floodplain management, covering land use and the change of flow areas was acquired. 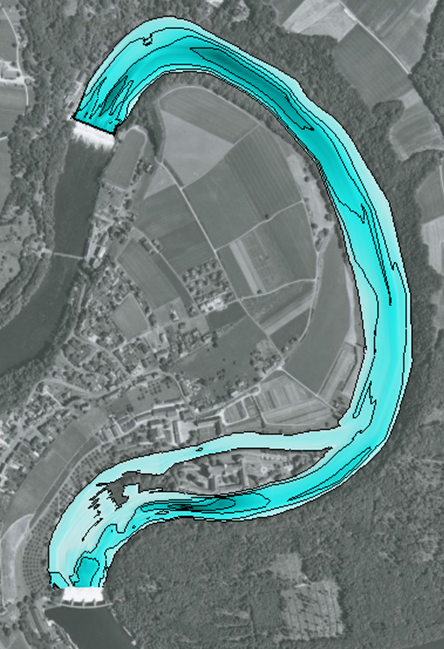 The river Lech is in Germany, between Forggensee and the river mouth into the Danube, substantially influenced by hydropower and its flow regime and morphodynamics are heavily modified. The reach “Litzauer Schleife” is the last free-flowing reach of the Lech. In terms of morphology it is categorized as near-nature, even if the morphodynamics and the composition of the river bed have already changed. Because of this particular significance it has been declared as nature reserve. According to the European Water Framework Directive the hydro-ecological condition with regard to the fish population is moderate. The objective of this project is to evaluate the impact of hydropeaking on the target species grayling, especially juvenile, and to develop measures to enhance the habitat conditions. An extension of the habitat model CASiMiR-Fish allows to take unsteady parameters, such as the rate of water level fluctuations, into account. Those unsteady parameters play a key role in the endangerments of fish caused by hydropeaking. All investigations were based on a hydrodynamic-numerical 2D model (HN-model). To analyze the migration connectivity and to capture the habitat availability, the simulation results from the steady 2D HN-model were investigated using the module CASiMiR-Fish. Unsteady simulations of predefined hydropeaking events were used to analyze the ecological impacts of the flush for the initial state and for different flushing scenarios and different variants of morphological measures. Furthermore the risk of stranding juveniles was calculated, using a fuzzy-logic approach. Considering all aspects, a final operation design with reduced risk for young fish life stages could be recommended. 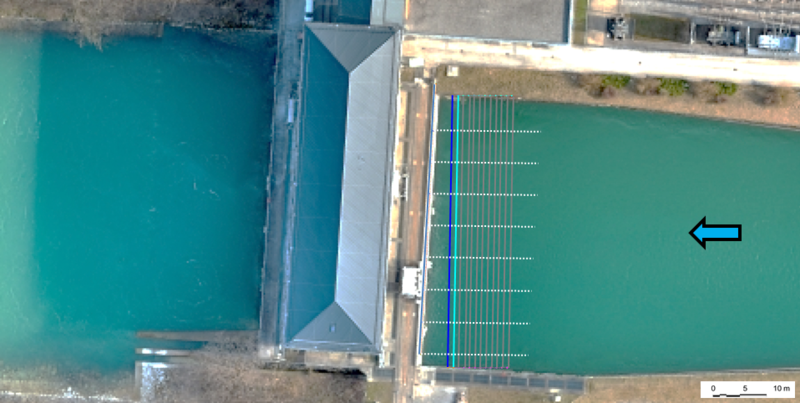 To fulfill the requirement of a highly resoluted river model with detailed information of the low gradient river banks drone flights were performed followed by structure from motion (SfM) evaluation. Based on the project data a new approach for the definition of depth-dependent roughness in hydraulic simulations has been devevelopped. The referring paper can be found here. Fishes possess a lateral line system consisting of body-oriented neuromasts, which are sensitive to fluctuating spatial gradients of the velocity and pressure fields. Current studies of fish behaviour and hydrodynamics rely on point measurements of the flow field, and as such cannot account for the fluid-body interactions experience by the aquatic organism. In order to provide a closer look at these interactions, a bioinspired, fish-shaped lateral line probe has been developed, calibrated and tested under laboratory conditions. Vertical slot fishways represent the most common class of hydraulic fish pass structures. 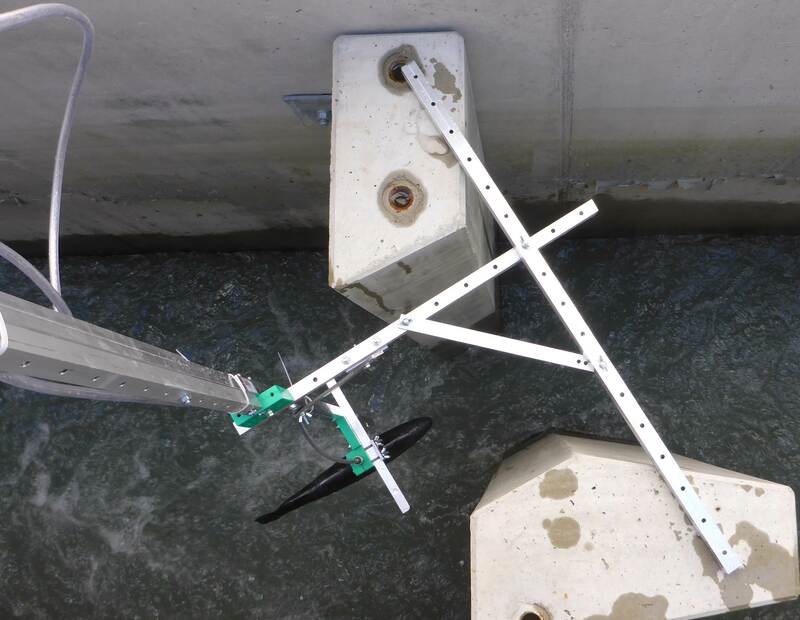 The objective of this project was to test the developed probe in vertical slot fishways. The goal of this project was to apply the mentioned fish-shaped probe for the first time in three fish migration facilities, i.e. vertical slot fishways, to capture innatura hydrodynamic signatures in the slots and across the pools. It could be determined that standard signatures in the slots could be found, characterizing the pools of the fishways. Those signatures could be compared to individual slot measurements to determine if the flow conditions were uniform and to detect outliers, in reference to the guidelines from the Austrian Water and Waste Management Association. In the context of connectivity of rivers, upstream and downstream migration of fish are fundamental aspects. Transverse structures could interrupt downstream migration by allowing only a small proportion of aquatic species to pass. 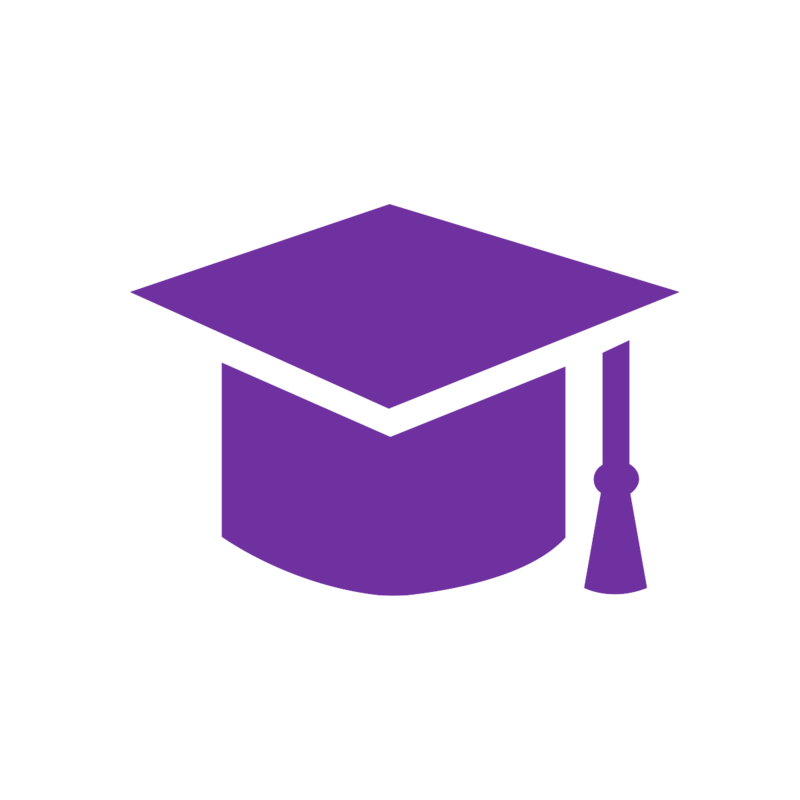 The scientific knowledge and appropriate technical facilities for downstream migration are not as developed as the ones for upstream migration. It is state of the art to install physical barriers in front of the power plant inlet, to prevent the entering of debris and fishes into the turbines. Therefore it is important to study the hydraulic conditions in front of the grills to analyze the behavior of the approaching fishes and the dependence on the hydraulic flow. 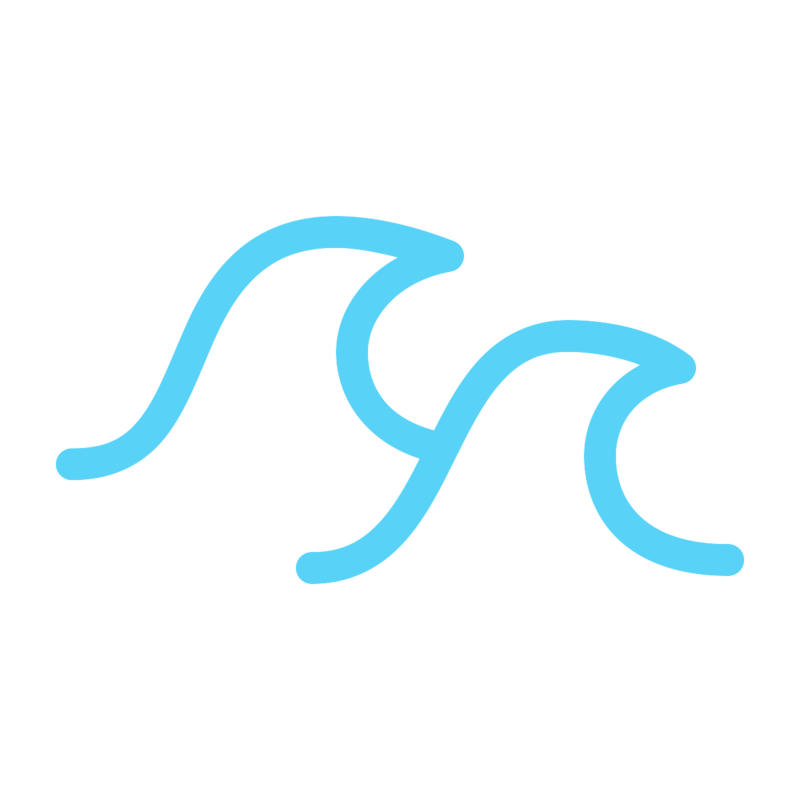 Although it is well-known, that turbulence of flow influences the swimming behaviour and the hydraulic preferences of fish, there is no device to measure turbulence adequately in the field. This is one of the first projects to develop and apply a hydraulic measuring device, inspired by biology, oriented at the pressure sensitive lateral line. The combination of explicit locally, temporally averaged flow velocities measured by ADCP and the pressure variations measured by a pressure box provides a way to describe the complex, dynamic hydraulic conditions experienced by fish, at the inlet of hydropower plants. Within the scope of a research project the impacts of climate change on the floodplain Rastatter Rheinaue were investigated and aimed at an interdisciplinary development of adaption strategies to its long-term preservation. Based on a hydrodynamic-numerical model, the floodplain succession model CASiMiR-Vegetation was used, investigating the initial situation as well as different potential scenarios. Those scenarios vary in their discharge development during the next decades and the resultant calculated discharges. On the other hand the geometry of the floodplain topography and the management of flood culverts had to be implemented into the different scenarios. 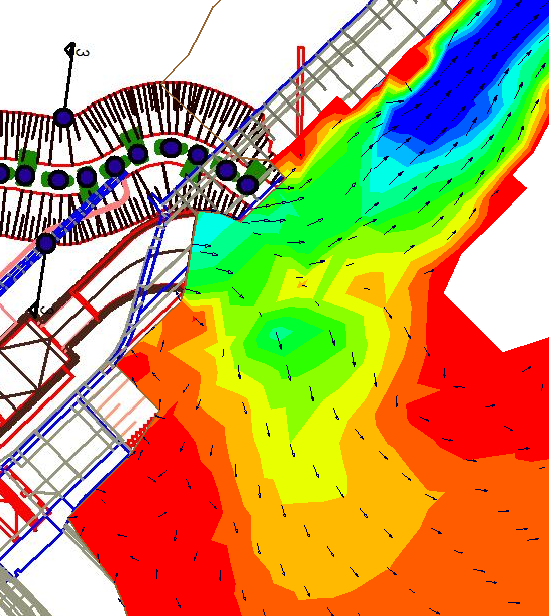 In this project SJE set up a hydrodynamic-numerical model of the river reach. In order to reproduce the geometry of the river bed, the riparian forelands and particularly the dike correctly, break lines were set manually, while setting up the mesh. 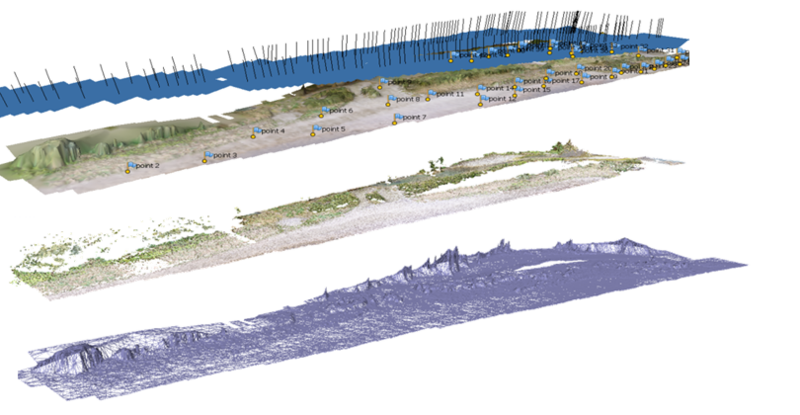 Further topographic features were identified during location inspection and implemented into the model. The hydrodynamic-numerical model was calibrated for 6 different flood events (HQ 1 – HQ 100).The following figure (bottom) shows the flowchart of the module CASiMiR-Vegetation. The Nanjing Hydraulic Research Institute was given a webinar, introducing ecohydraulics and habitat modeling. Firstly the motivation respectively the potential of using habitat modeling in context of ecological issues of water bodies was pointed out. Furthermore the interfaces of physics and biology were presented and it was shown, how they are implemented into the module CASiMiR-Fish. Potential measures to enhance the morphological situation and environmentally friendly hydropower plant operation designs were outlined. After showing how to transfer habitat preferences into a fuzzy rule based system, a CASiMiR-Fish tutorial was given using an example of application. Hydropeaking presents one of the large impacts on river ecology and is gaining importance because of an increasingly volatile energy market with high portions of new renewable energies dependent on local climate conditions. An unnatural flow regime with extreme variations of discharge (flush vs. minimum flow) is a challenge to all aquatic species. This project investigated the impacts of hydropeaking on macrobenthic invertebrates in Norway. In this project a fuzzy rule based model for the assessment of macrobenthic habitats under hydropeaking impacts was developed. 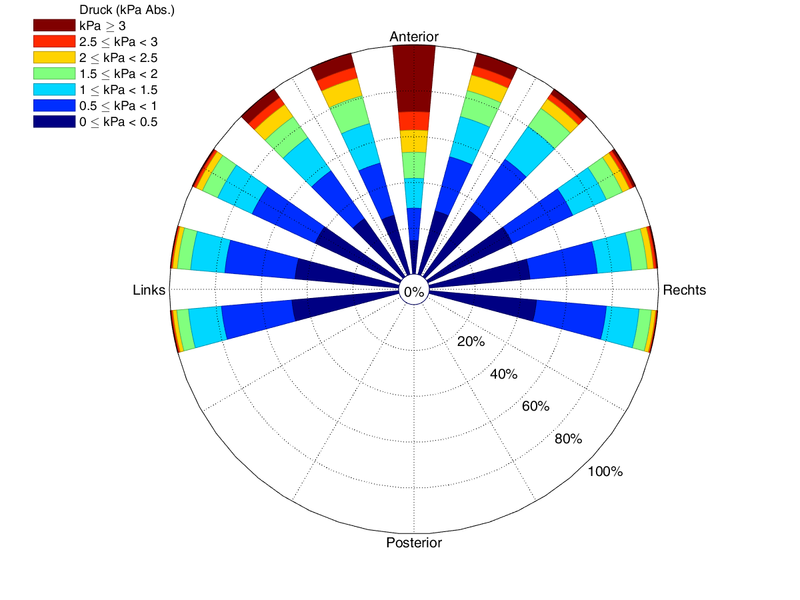 Preference data of the three taxa Baetis rhodani, Hydroptila spp. and Allogamus auricollis with distinctively different habitat requirements, related to near-bottom flow forces (high/low forces, and narrow range) were used. These data were transferred into the multivariate fuzzy rule based physical habitat model CASiMiR. Persistent habitats were assessed for different scenarios of hydropeaking operation in order to evaluate the hydropeaking impacts on organisms with low mobility. 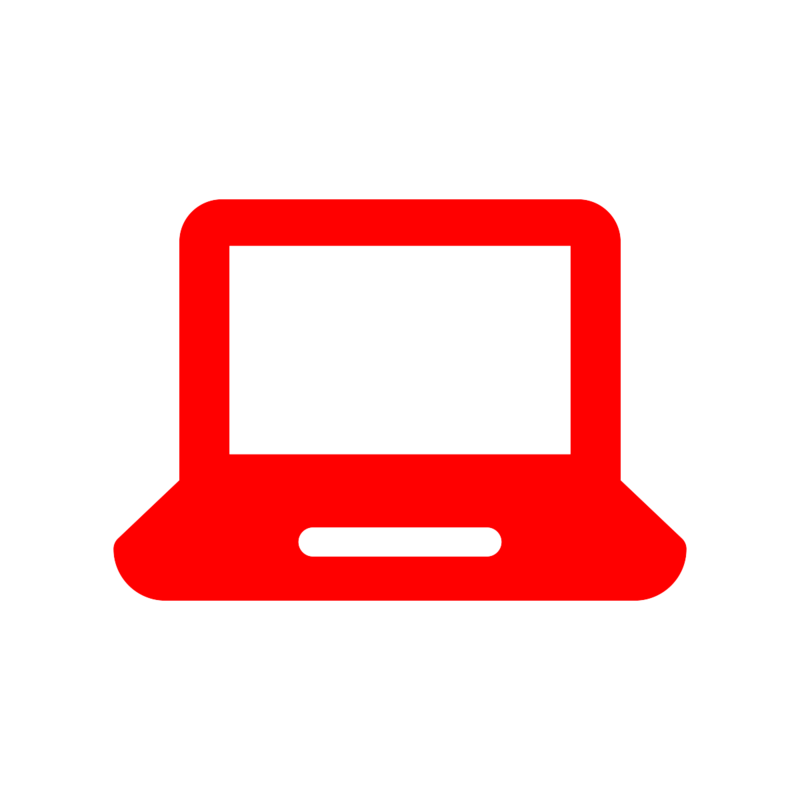 A publication about the project can be found here.